The inherent safety features of a Na-ion cell are distinct and unique to the chemistry. The dangers of transporting Li-ion batteries are well documented, and they cannot be discharged below 30% SOC, so cargo cells must be air-freight transported at considerable cost. However, a sodium-ion cell can be fully discharged to zero volts, akin to a capacitor. In this state, the potential for thermal runaway due to short-circuiting is eliminated. Faradion are working with the Department for Transport and UN Sub-Committee of Experts on the Transport of Dangerous Goods to develop the framework for the testing and transportation requirements for sodium-ion batteries. See here for more details. This diagram shows the thermal output of a sodium-ion cell at zero volts (= 0% state-of-charge, SOC) as it’s heated and a lithium-ion cell at full charge (100% SOC), heated under the same conditions. The amount of heat generated by the lithium-ion cell is over 15 times greater than the sodium-ion cell. The nature and properties of sodium-ion materials means the chemistry is safer than Li-ion, not only when fully discharged but also when charged. Sodium-ion battery electrolytes have been shown to be more stable than their lithium-ion counterparts; for example Kuze at al. 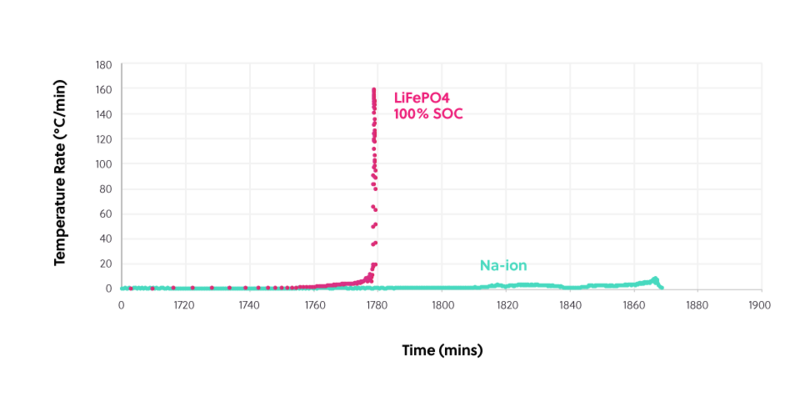 report that the sodium-ion electrolyte NaPF6 in PC, in combination with a hard carbon anode, releases energy at a temperature 90oC above that of the lithium-ion electrolyte, LiPF6 in EC-DMC with a graphite anode. Nail penetration of sodium-ion cells at full charge show no flames or evidence of ignition, demonstrating that the technology passes this test successfully.